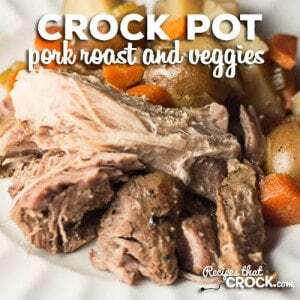 Crock Pot Pork Roast and Veggies - Recipes That Crock! 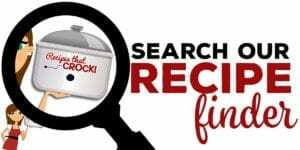 Do you enjoy a good Pork Roast? I sure do! 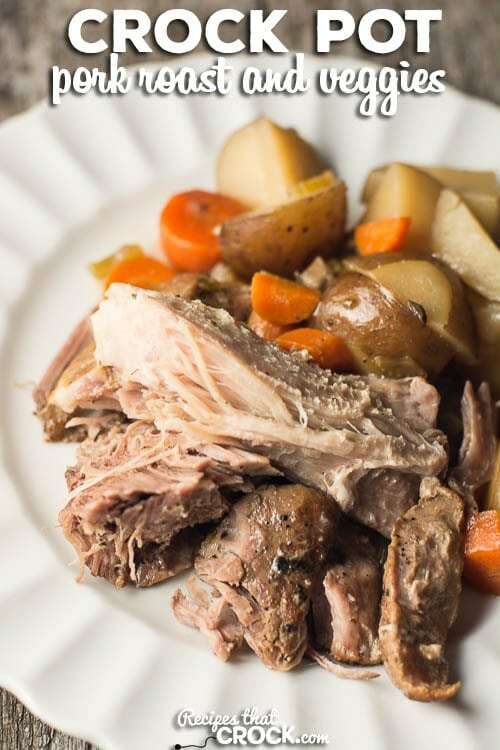 This Crock Pot Pork Roast and Veggies recipe is one of our absolute favorites. It is so easy and so delicious! I can remember when Puddie and I were dating, we would often ask each other about favorite foods and dishes and one of the things I told him I loved was cooked carrots. This recipe totally reminded me why. Now, mom would always use a bag of full sized carrots and chop them up and put them in with roasts and I just LOVED a good carrot cooked in with a roast all day. However, I have grown accustomed to using sweet petite carrots in a lot of my dishes since leaving home. But, when I saw this recipe in my friend Mary’s new cookbook Deep South Dish: Homestyle Southern Recipes (thanks for sending me a copy Mary! ), I just knew I wanted to try this recipe the way my mom used to (and the way Mary does in her book). I was not disappointed one bit! Now here I am going on and on about carrots, but really the pork roast itself is fantastic. Flavorful, moist and tender! You guys are going to love this recipe, I just know it! Heat oil in a skillet (or stove top safe crock) and season roast with garlic, salt, pepper and cajun seasoning. 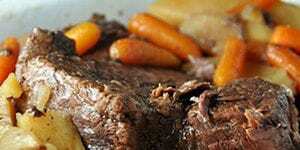 Brown roast in oil on all sides, then set aside on a nearby plate. Pour water in skillet to lift all brown bits from pan. Place veggies in the crock and pour juices on top. 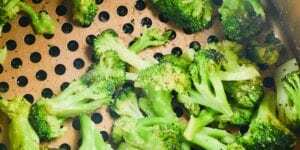 Create a well in the center of the veggies then place roast fat side up in the center. Pour soups on top of the roast and season with thyme and sage. Cook on high for 6-8 hours or low for 8-10. 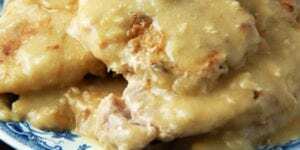 Recipe from Deep South Dish: Homestyle Southern Recipes. This recipe will do well in any 5-6 qt slow cooker.We liked using our all-in-one slow cooker that has a browning setting to allow you to brown your roast in the slow cooker instead of the stove top and then switch it to slow cooking setting. Absolutely fabulous! 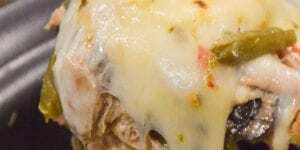 Usually have open face sandwiches with leftover roast the following day. Not this time. There isn’t even a teaspoon of the well developed rich gravy in the bottom of my crock pot. This recipe is not only a keeper but it will be filed under the family favourite heading. And with a home full of picky eaters that is high praise indeed. 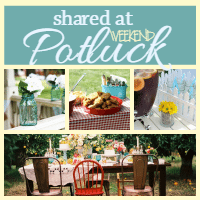 Thank you so very much from the bottom of my heart and a cleaned plate for sharing this recipe. So glad to hear it H.G.!! It is one of my favorites too. I’m so happy that you loved it Cris and thank you SO much for hosting a giveaway for the book too. I really appreciate the love & support!! My pleasure Mary! It was such a treat! 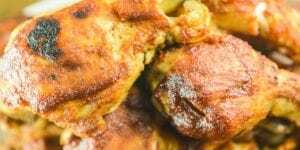 I would really apreciate if you try cooking pork a little less time I am not complaining i am reguesting a little info because i would really like a recipe that would make pork more juicy and i dont know how. i follow you and would like to get one more juicy. 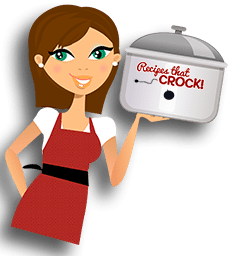 Every slow cooker cooks different depending on age, style, size, etc. My roast was very tender and juicy. If you are having trouble with yours you may try using a meat thermometer and begin checking your meat’s tenderness once it hits 145. It will get more tender as it cooks. I tend to like to cook mine to at least 160 for the texture we desire. You also might check to make sure you are using a roast with a nice bit of fat in it. That will also help with your juiciness. Hope that helps. On the pork roast with veggies, do you dilute the soup with water? Nope! Just use the contents of the can and the remaining ingredients as shared in the directions. Enjoy!